Those glistening decorations this time of year are a toddler magnet, amiright? But a felt Christmas tree is the perfect spot to keep tiny hands occupied and away from the breakable keepsake ornaments! With the help of a little static cling, felt sticks to felt—no adhesive needed! Felt also sticks to flannel. For this project I used 1.5 yards of a green plaid flannel I found at Joann Fabrics, but you can cut the tree shape out of solid green felt too (it’s easier). My tree ended up being 52″ tall by 41″ wide, but feel free to make yours whatever size you’d like. 1. Fold your tree fabric in half. With chalk, draw half of your tree shape along the folded edge. If you’re nervous about sketching a perfect tree, just draw a simple triangle! Cut it out. 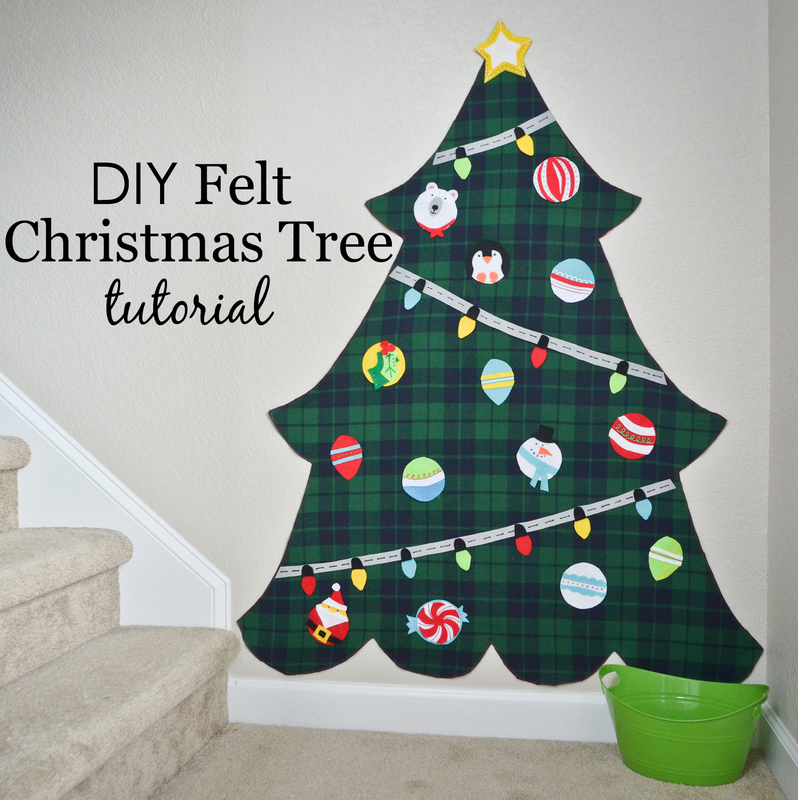 If you are using solid felt for the tree and not flannel, skip ahead to step 5. 2. Flannel is too flimsy to be attached to the wall alone—it needs a felt backer. Open up the tree, and lay it out atop a large piece of felt. Trace with chalk, but don’t cut yet! 3. Attach the flannel to the felt with spray adhesive—use the chalk outline as a guide for where to spray the glue. Gluing small sections at a time allows you to smooth the flannel down nicely, avoiding bumps or creases. After the glue has dried, cut the tree out of the felt. 4. One great thing about felt is that the edges don’t fray. Unfortunately, this is not true for flannel. Therefore, you will need a sewing machine to bind the edges together with an overlock or zigzag stitch. 5. Now for the fun part! Create all your ornaments out of colorful felt layers. Trace cups with chalk to make perfect circles. Joann’s sells specialty felt glue for attaching the various bits together. Or if you’re impatient like me, the low setting on a hot glue gun works just as well. 6. After gluing the larger felt shapes together, I went back with puff paint to add more details. 7. To attach the tree to the wall, apply small Command poster strips all along the edges and stick it up. Double sided poster tape might also work. 8. Place all the ornaments in a small tub, and hand them over to your merry little helpers. Who knows—they might have so much fun decorating (and undecorating) their own felt Christmas tree that they’ll forget all about the low hanging temptations on the real one! Hayley is the creative genius behind Grey House Harbor; a lifestyle blog where imagination and real life collide. She resides in Virginia with her husband and two kids - all of whom graciously endure her big ideas and habitual DIY ways.